Dogs and cats have four legs. Centipedes have about 100 legs. 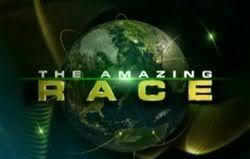 The Amazing Race has 12. I think that sounds right. (8:00-9:00 PM, ET/PT) from Beijing to Maui for the final leg and the chance to claim the $1 million prize. Phil Keoghan hosts. Can I just say how glad I am that we get 12 legs this season. I really, really wasn't pleased with 11. Though of course, I still want 13 (Oh who am I kidding about a season of 22 legs lets kill the racers). I say a full season of 26 legs! I'd like to see a 2 hour premiere or final episode. The best option to me is a 12 episode, 12 leg season with a two-hour premiere, and one hour finale. Either that, or an 11 episode 12 leg season with a double-length finale that includes the last two legs if the penultimate is a non-elim. I miss the 2 hour premieres. Maybe CBS can return to that in the next season. And perhaps a clip show somewhere in the middle. Wait. Here, they're saying the finale is on May 4/5. It either means: a) the network thinks it's just 11 episodes or b) they're showing the last two legs in a 2-hour finale. I agree Ashe, kind if stinky that the next leg is the predictable NEL, unless they have some other plan but... I don't think so. Now last episode would have been a nice surprise if we were to have a back to back NEL. WRP/CBS would never allow the Finale to be run overseas before running here. ^^I know, but then they allowed the network to air the show without commercials (hence leading to my banning), but who knows really.